Two researchers from The Neuro are among just ten nationwide to receive Early-Career Capacity Building Grants this year from the Azrieli Foundation in partnership with the Brain Canada Foundation. 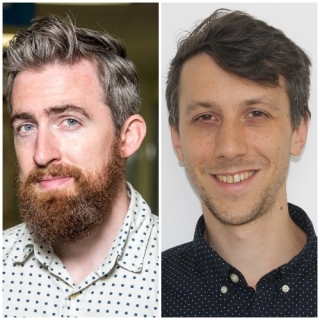 Researchers Adrien Peyrache and Stuart Trenholm will study epilepsy and vision, respectively. The grants support early-career investigators who are conducting transformative research to advance understanding of the brain, in illness or health. “This grant will allow us to make a big leap forward in terms of buying new equipment to help us understand what’s going on with epileptic patients at the level of a single neuron,” says Peyrache. This initiative provides an opportunity for the researchers to begin building their careers in Canada, and is in alignment with the federal government’s priority of supporting early-career researchers conducting world-class research. The funding, provided by the Azrieli Foundation and Brain Canada, with the financial support of Health Canada through the Canada Brain Research Fund, provides each of the 10 recipients a $100,000-grant, for a total investment of $1M. The grantees were selected from 84 applicants, following a national open call and rigorous review process involving Canadian and international researchers and clinicians. The researchers are located at institutions across Canada, with some of the funded projects focusing on specific diseases and disorders such as Alzheimer’s, autism, epilepsy, multiple sclerosis and others targeting multiple areas. The findings from their research have the potential to fundamentally change our understanding of nervous system function and dysfunction and the impact on health. For a complete list and photos of the recipients, click here.